The portrait is on a non-pertinent, draped bust emerging from a foliate base. The face is characterized by large, wide-open eyes with iris and pupil incised and tight lips that convey a general impression of sadness. Probably this is a funerary portrait of an elderly woman. Her hair is cropped back over the forehead, while the nape is perfectly smooth; this appears to suggest that originally the head was veiled. 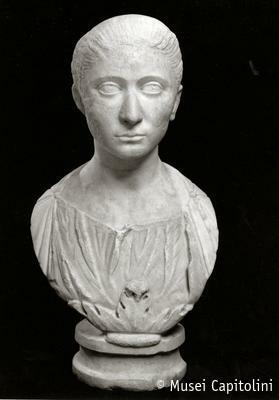 The portrait dates back to the late Antonine or the early Severan period; the bust, instead, dates to an earlier period, presumably the Trajanic age (90-100 d.C.).